JAMMU, Sept 3: Sainik Samaj Party, a national party having its presence in twenty-five states in the country, has made its maiden foray in J&K politics. In a statement issued by Colonel S S Pathania, chief convener and president, Sainik Samaj Party (J&K) said that the State unit of the party was launched early this year. He said that the party is an amalgam of Armed Para-Military Police Forces and citizen soldiers. 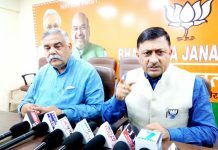 Pathania stated that party has decided to field its candidates in the upcoming Municipal elections and support the candidates for Panchayat elections scheduled to be held in October and December, this year. The party convener expressed confidence that people who are genuinely looking for an option for the change will certainly support the party in both the elections. He said that empowerment of women and youth will be top priority of the party leadership which will be seriously working in this direction. “The involvement of industry including small/big entrepreneurs will also be sought for getting jobs for the youth by the party”, he said and hoped that party will get good support from the people in the forthcoming elections.